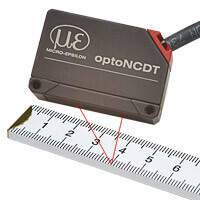 The optoNCDT1420 offers a unique combination of speed, size, performance and application versatility for displacement, distance and position measurements. The compact triangulation sensor achieves a high measurement accuracy and measuring rates of up to 4kHz. The selectable connector type, i.e. cable or pigtail, together with compact size reduce the sensor installation effort to a minimum. Just like all triangulation sensors from Micro-Epsilon, the optoNCDT 1420 provides an intelligent surface regulation. The Auto Target Compensation (ATC) ensures stable measurement results regardless of changing surface colors or brightness. The high-performance optical system generates a small light spot which enables to even detect smallest components reliably. Compact size combined with low weight opens up new fields of application. As well as analog voltage and current outputs and a digital RS422 interface enable to integrate the sensor into plant or machine control systems. Due to the selectable setting and evaluation possibilities, the optoNCDT 1420 meets the requirements for use in high volume and OEM applications. All optoNCDT 1420 models are operated using an intuitive web interface. Presets and a quality slider for the selection of the measurement task enable the sensor parameter set up. Up to eight user-specific sensors settings can be stored and exported in the setup management. Set ups can be quickly and easily saved, loaded and transferred to further sensors. The video signal display, the signal peak selection and a freely adjustable signal averaging enable to additionally optimize the measurement tasks. The ROI function (region of interest) allows e.g. for interfering signals in the background to be filtered out. 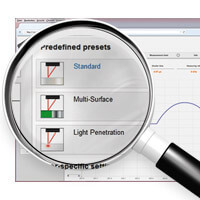 The multifunction button enables quick sensor commissioning for easier measurement tasks.